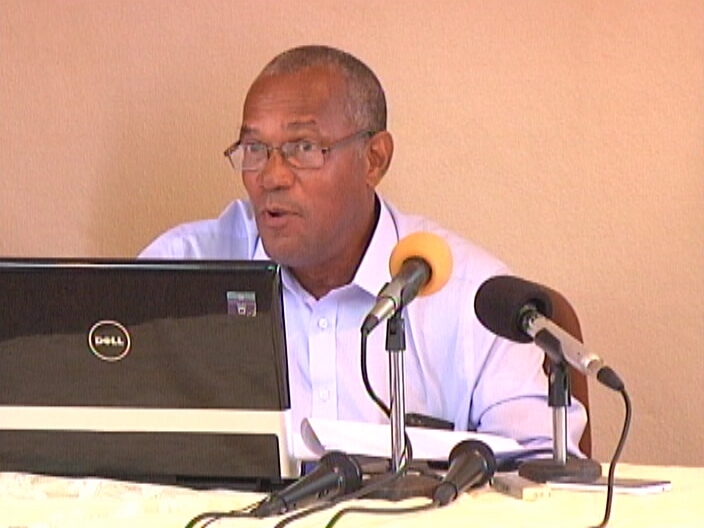 "In April 2014, there were 16,730 persons unemployed in the country of Belize. This is down from 17,375 persons in April 2013. So, the unemployed persons are down very slightly. The national unemployment rate is 11.1% as of April 2014, and that's down very slightly from April 2013. In April 2013, the unemployment rate was 11.7%. So, there is a slight decrease in the unemployment rate. 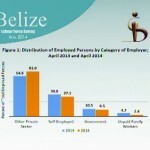 The highest unemployment rate was recorded in the Belize District at 14.3%, which is up substantially from April 2013. In April 2013, it was 11.6%. The lowest unemployment rate was recorded in Toledo District as 4.1%; this is substantially down. In 2013, it was 8.0%, and so, it's down dramatically, but that's due mainly to people dropping out of the labour force, dropping out from the unemployed persons, just become not in the labour force. For the Creoles, it's 16.3%, which basically is what it was in April 2013. The Garifuna, the rate has gone up to 18%, from 12.8%, the Mestizo, 9.1%, down a little bit from 10%. It's virtually the same. The Maya, the rates have fallen dramatically, 4.5%, and I alluded to this. Perhaps, what happened was that the labour force, people just left the labour force and basically gave up. The unemployment rates for women is 19.4%, the unemployment rate for men is 5.9%, and this is basically what has been happening over the years." The greatest employment gains were in the Belize and Cayo districts and mainly in the private sector. The greatest number of jobs was added in agriculture forestry and fisheries and mainly in the Stann Creek District due to aquaculture. 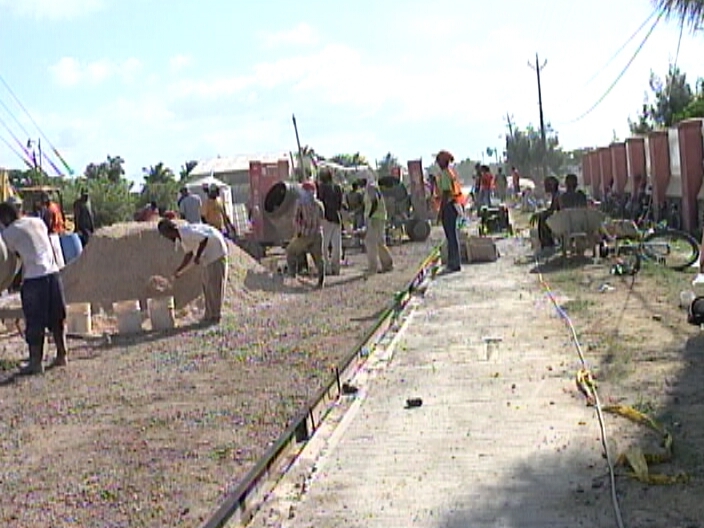 Construction – for all those road works also added three thousand jobs. For comparison, Jamaica's unemployment rate is 14.9%, Trinidad and Tobago 11.33%, and Barbados 13.2% to Belize's 11.1%. The Statistical Institute also released its latest findings on life expectancy. The good news is that, on average, Belizeans are living five years longer than they did in 1980. In that year, the average life expectancy was 69 years old, and the latest survey shows that it is now 74. That's the average, but women have slightly greater life expectancy than men. "The life expectancy - the life tables allow us to see how well we're doing compared to our neighbors, and here, you will see that, we're pretty much on par with Mexico and Panama. However, Costa Rica is about 5 years ahead of us. On the other hand, we're about 8 years or so ahead of Nicaragua. Since we're a member of CARICOM, we can also compare ourselves to the CARICOM countries, and we can see that across the board, we're pretty much in the same league as the rest of the Caribbean in terms of life expectancy." So that we don't boggle you with too much numbers, tomorrow, we'll tell you about the consumer price index and external trade. 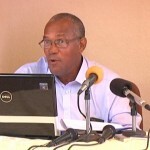 The Statistical Institute of Belize (SIB) held another in its series of press conferences, this time covering in addition to the monthly consumer price index and trade statistics news on life expectancy for Belizeans and the twice-yearly labour force survey. Compared to April of last year, unemployment is down slightly from 11.7% to 11.1%. The last survey was actually in September and showed a rate of 14.2%, but that is due to seasonal employment fluctuations. Continuing trends include one-fifth of the unemployed population being youths, and nearly 4 times as many women as men without a job. The labour force is now over 151,000 persons over 14 who have a job. 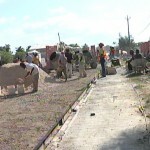 The highest rate of unemployment is in the Belize District at 14.5%. Agriculture and construction each added over 3,000 jobs in the year April 2012 to 2013, part of a total of 10,000+ jobs added; but over 2,000 were lost in the accommodation, food and wholesale/retail sectors. Turning to trade, Belize continues to suffer the ill effects of downturns in sugar, citrus and petroleum exports. All three tumbled by as much as 30% each in the first five months of this year, but the first two are expected to rebound from slow starts. As a result Belize exported just $255 million worth of goods and imported nearly $800 million, the majority fuel and manufactured goods. Belize imports 95% of its fuel from Venezuela, but the imports actually from the former Dutch dependency of Curacao which refines the oil sent from Venezuela. Belizeans of the current generation are living longer, on average, than there parents. Life expectancy at birth for Belizeans is up by five years to 73.7, and the good news is that once you have survived your first year, you will live to see many more. It has an impact on how Government assesses its pension schemes like Social Security, as retirees at 55 can expect to live another 25 years on average. Insurance companies as well are looking at the life expectancy statistics to assess their schemes. And finally, the inflation rate has remained stable at 1.6%, with airfare prices, certain foods like fruits and vegetables, water rates, rent prices and hotel prices carrying the bulk of the increase. San Ignacio and Santa Elena residents are paying the highest rates at 2.8%, mostly for furnishing their homes. Punta Gorda residents are at the other end of the spectrum at 0.8% rate of inflation. Increases of some vegetables are especially punishing with black beans up a third and red kidney beans, which we also export, up 22.5%.